We are rethinking how to make food accessible in Indianapolis. Our store uses a different model for distributing food. We use food recovery to make wholesome food both affordable and accessible, while simultaneously reducing food waste. Indianapolis is one of the worst ranking cities in regards to food accessibility. The problem continues to worsen as grocery stores close, leaving even more local communities without access to a reliable source of healthy food. Using food recovery allows us to source wholesome food for less, so we can price well below market value and be sustainable in neighborhoods that have been left by traditional grocery stores. It's estimated that about 40% of food produced in America is wasted and ultimately ends up in a landfill. At the same time 1 in 8 (12.5%) Americans face food insecurity, which the USDA defines as the lack of access, at times, to enough food for all household members. This indicates a broken distribution system that needs, changes, and that is what Under the Sun Market is doing. When traditional food retailers end up with overstock or products approaching expiration dates, large quantities of perfectly safe and high quality food goes to waste. What we do is recover that wholesome food, and redistribute it through our stores at accessible prices. By this process we offer a wide variety of name-brand products for generously discounted prices. We are rethinking how local produce is sold. Under the Sun Market is able to make fresh, locally-grown produce available by using a consignment model with local farmers. We allow local farmers to sell their produce at our store rather than buying their produce and selling it ourselves. This removes the middleman markup so we can make fresh produce accessible at an affordable price in neighborhoods around Indianapolis with otherwise very limited access to fresh produce. Unlike traditional grocery stores who sell produce that spends days being transported and stores, our produce is picked at the farm and dropped off the next day. This guarantees our customers the freshest produce. It also gives local farmers six days of market access each week in our store, rather than a few hours at a farmers market. Since these farmers are able to sell more, they are also willing to sell for less! Within this consignment model we are able to partner with farmers and nonprofits who share our goal of increasing food access within our city. It’s a win-win for local farmers and local communities. Under the Sun Market sells a wide variety of good across all categories. We originally started out as an online liquidation company and we have kept this aspect of our business because our customers love finding deals at our store. We have a rotating inventory. Which means our selection is ever changing, everyday we have new products on our shelves, replacing whatever was there before. Great deals are waiting at Under the Sun Market, from everyday essentials like toilet paper and deodorant to less-essentials like face paint and chia pets. 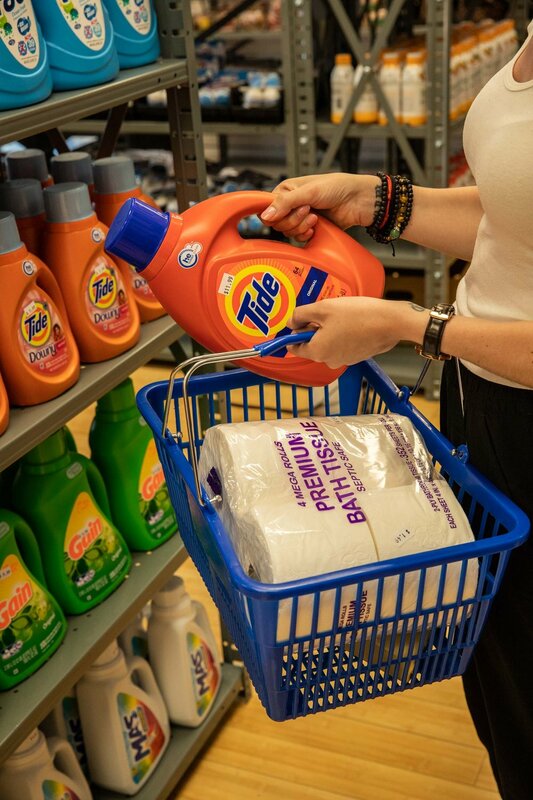 We have something for everyone, and though our specific inventory changes daily we almost always have name-brand items in a wide variety of categories.